I noticed this talk relating to this book, and that made me wonder whether it had anything useful to say. Hasn't the word of experts always been subject to challenge? Aren't we told to "Take nobody's word for it"? It's true that many supposed arguments don't seem particularly coherent, but maybe that has always been the case and with the coming of the internet we just noticed it more. And it's possible that as experts are (quite reasonably) expected to justify what they do to the public, there is more of an opportunity for conflict. To me the question shouldn't be "How can we get people to respect authority", but rather "How can we get people to recognise the shallowness of arguments". Possibly that will be the message of this book, I'll have to see. On starting to read the book, it doesn't seem to be pushing the 'Argument from Authority' angle that much, but I begin to wonder what it will actually have to say. It also seems that the book is mostly concerned with what is happening in the USA. 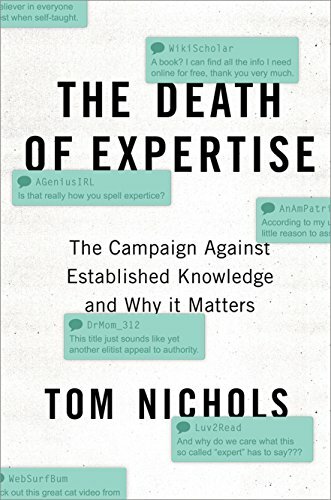 I'm a bit suspicious about the author's claims that rejection of expertise has been increasing. For instance in the 1950's there were C. P. Snow's two cultures, where the literary elite looked down upon science. Then there were postmodernist ideas, which certainly had an anti-expert direction. But I've only just started the book, so it will be interesting to see how the arguments develop.